(Dec. 9, 2009)--The University Center Ballroom on the UTSA Main Campus was filled with the smell of tamales, pastries and breakfast tacos yesterday as nearly 1,000 UTSA employees came out to celebrate the holidays and enjoy a complimentary breakfast with President Ricardo Romo and Dr. Harriett Romo. This university thank-you to employees at holiday time has become a UTSA tradition over the years, but this time the event added a new twist that took generosity one step further. 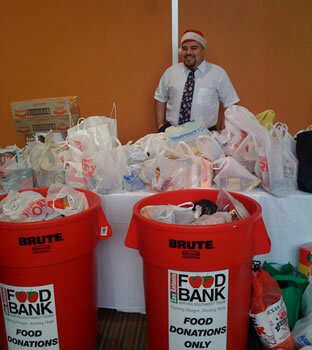 UTSA employees extended their gratitude to others in a big way by contributing to a food drive that was incorporated into the holiday breakfast festivities. According to food drive coordinator Roberto Rosas, a recent UTSA graduate now working as an administrative associate in the president's office, the mountains of canned food, boxed meals and beverages exceeded everyone's expectations. Working with the San Antonio Food Bank, Rosas thought he would need about three barrels delivered to campus, enough to collect about 1,000 lbs. of food. Instead, the tally was far more -- enough food to fill eight Food Bank barrels. "Instead of the one or two items per person that I expected, employees walked in, their arms filled with 10, sometimes 12 different dry good items," said Rosas. "Besides the items that we suggested, such as tuna, soup, and macaroni and cheese, some people even brought baby food." For those who were unable to attend the President's Holiday Breakfast, Cpl. Joe LoBrutto, working on behalf of the UTSA Police Department, is still collecting non-perishable food items on all three campuses through Friday, Dec. 11. For more information, contact Lt. Stephanie Padula at 210-458-4775. The Office of the President extends thanks to everyone who participated in the campus food drive.